This activity is a wonderful writing activity to complete right before Thanksgiving. Students will pretend they are turkeys that are likely going to be eaten for Thanksgiving. Their task is to write a persuasive paragraph or essay (both versions are available) to try and convince people NOT to eat them this year. Students love using their creativity to write this assignment and often say it was their favorite of the whole year! Have students create a turkey in disguise out of construction paper so that it makes it hard for Americans to find them and cook them. They LOVE taking their turkeys home to share with their families on Thanksgiving. 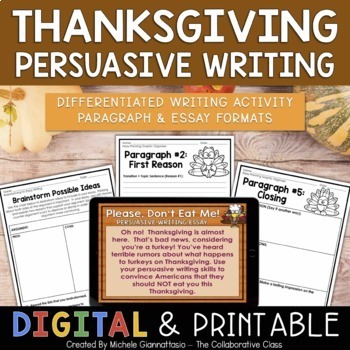 ✓ Persuasive writing task to either display on board or print and make copies for each student. ✓ Paragraph Writing Graphic Organizers - For use when time is limited or students are not yet ready to tackle a full essay. ✓ Final Draft Publishing Paper - Four different styles are included. Each style has a title page + a blank page. If you intend to share with others, please purchase an additional license.